In between the Tsunam Rose designs, I have been carrying on with orders and wanted to share this one with you as I am rather chuffed with it. 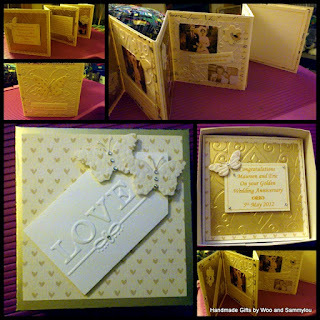 I had been asked to create a special keepsake card for a Golden Wedding anniversary and had already made my first concertina card for my younger sister's 30th with pictures of us and some quotes about sisters and family. Unfortunately, the pictures aren't great (it was late and I didn't have time to re-take before the card was collected) but I am very pleased with it, and so were the happy couple! OMG this is AWESOME! I love the style and the colours too.